Get the PD patch here. It’s simplified and permits manual control. It runs in PD Vanilla. The full album is here. Here are 8 sawtooth oscillators gliding up and down in pitch in equal intervals. They start at unison and end in octaves, a tritone from the starting pitch. In between are a surprising number of audible consonances, even though the overall sound is generally very dissonant. To avoid extremes in pitch, each oscillator is actually a Shepard-Risset glissando that returns to the same pitch every two octaves. The most frequently used model of consonance is harmonic concordance. For a simultaneity of multiple tones, consonance is heard when partials from one tone coincide with partials from another. For tones consisting of a harmonic series, this happens at integer ratios. For inharmonic tones, consonances occur at different intervals where the inharmonic partials coincide. In the video you can see only a very small number of harmonics, but the effect is illustrated rather clearly. 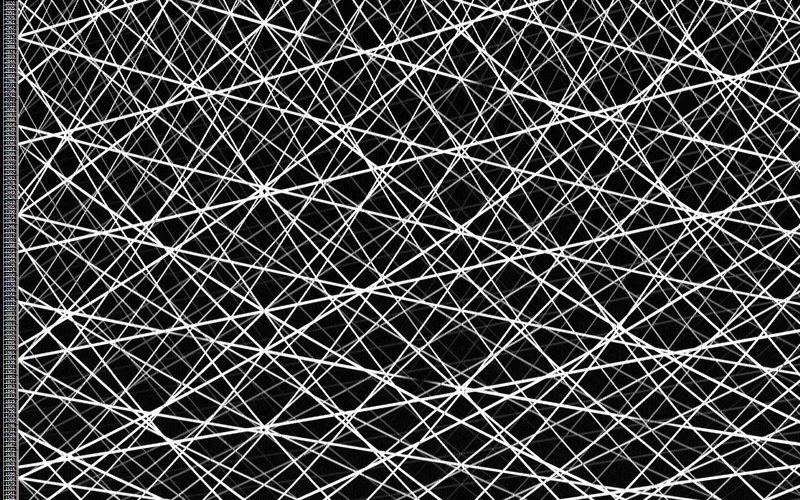 Consonances are audible when lines intersect and overlap. This isn’t the only way to represent it on a spectrogram. There’s a lot to explore by viewing it at different scales. It probably looks more interesting when zoomed out, but I think the video corresponds most closely to what’s actually audible. Here the consonances occur both at small integer ratios, and because the same inteveral is stacked 8 times, also at roots of those ratios, up to the seventh root. The greatest consonances occur when fundamental frequencies (and consequently all harmonics) coincide at equal divisions of the octave, up to 7 EDO. At 8 EDO intervals (odd multiples of 150 cents), all tones are equally spaced and none overlap. In general, partials audibly coincide about every 2 cents. Here’s a list of audibly consonant intervals. The columns represent the time where the interval occurs, the interval size in cents and the equivalent ratio. This isn’t a complete list; it includes only the relatively simple intervals. I made it by stepping through all possible intervals 0.1 cents at a time and noting the consonances. Then I found the ratios using an octave script. The output is edited somewhat. One thing worth noting here is that many intervals are almost exactly equal divisions of other intervals. For example, the 11/9 neutral third (347.408 cents) is close to two equal divisions of 3/2 (350.978 cents), three equal divisions of 20/11 (344.999 cents), four equal divisions of 20/9 (345.601 cents), five equal divisions of 30/11 (347.390 cents) and six equal divisions of 10/3 (347.393 cents). This implies that interesting chords can be constructed by stacking these intervals.